For centuries, poets and philosophers extolled the benefits of a walk in the woods: Beethoven drew inspiration from rocks and trees; Wordsworth composed while tromping over the heath; Nikola Tesla conceived the electric motor while visiting a park. 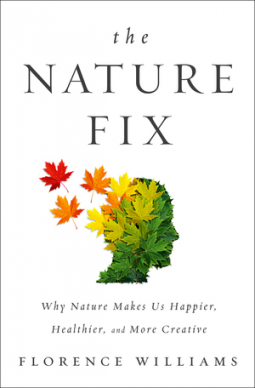 Intrigued by our storied renewal in the natural world, Florence Williams sets out to uncover the science behind nature’s positive effects on the brain. From forest trails in Korea, to islands in Finland, to groves of eucalyptus in California, Williams investigates the science at the confluence of environment, mood, health, and creativity. Delving into completely new research, she uncovers the powers of the natural world to improve health, promote reflection and innovation, and ultimately strengthen our relationships. As our modern lives shift dramatically indoors, these ideas—and the answers they yield—are more urgent than ever. You may remember that I reviewed a book called ‘The Biophilia Effect‘, and I was rather sceptical about it, since the research was rather narrow and they hadn’t shown a pathway for the effect? This books expands upon the same theme, and is rather easier to read. The author travels around the world to talk to researchers trying to find out why being out in the natural world is good for us, and describes her adventures, as well as the work of the researchers she meets, in a clear and enthusiastic manner. Williams takes in wilderness therapy with woman war veterans in the American west, meets teenage boys with ADHD from the SOAR boarding school as they climb cliffs and camp, acts as a guinea pig for South Korean scientists trying to discover what sort of outdoor experience is needed, visits Finnish islands and and city parks, and spends a week in the badlands with a group of neuroscientists, thinking up their next experiments. She participates in experiments and discussion, adventures and gentle strolls, all to gather as much information as she can about the benefits of nature for humans. None of the scientists come up with a possible pathway either, but they do have ideas, about the landscapes that humans evolved in and about fascination, about how much time children need to play, and why, about how much and what sort of outside time we all need to refresh and relax. The answers are varied but boil down to: get outside as much as you can, listen to the bird song and walk beneath the trees, find wilderness and feel awe. Williams discusses in her closing chapters the pressing issue of how we apply the findings of so many researchers from across different branches of the sciences – that nature is good for humans – in a world where more than 50% of us live in urban environments, some with little to no access to parks or even street trees. Not everyone can afford to go for a fortnights kayaking adventure holiday in Colorado every year. Some cities have opened up their underground rivers again, forming blue corridors through the streets that flourish with life and provide the humans with the nature experience they need; some cities have formed groups to make it easier and safer for people to use the parks they already have; and Singapore is showing the way forward with it’s city in a garden ethos. I recommend this book, because it says (I paraphrase) even if all you can manage is sitting in your garden or looking at the birds from a window, you’re doing yourself good. So often, those who can’t get out or can’t afford to get out are left behind. Also, I tried a little experiment, listening to bird song and nature sounds while I’m reading or writing. It certainly is a lot more relaxing, and last week when I had a bad autism day, the podcasts that usually relax me didn’t help, but the bird song and woodland sounds did. The author visits a wide range of scientists and covers a lot of ground, and manages to explain the science in a clear and helpful manner.